On the way to Cafe Lakoza, I attempt to get Bennie enthused about our impending lunch by indicating he will be free to order a halal snack pack. “I’m all done with halal snack packs,” he says. Hmmm – it seems another teen fixation has fallen by the wayside. I can’t say I’m upset. 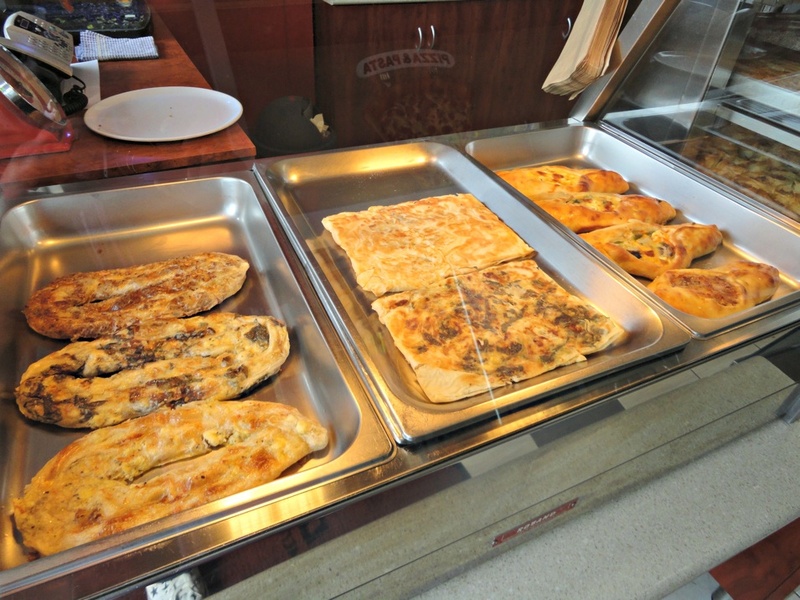 So if an HSP isn’t the go, I suggest we may want to get stuck into the Turkish breakfast feast on offer. It’s the kind of thing – replete with all sorts of sweet and savoury offerings – we’ve had before in more northern suburbs, but never in the west. As it turns out, we arrive after the noon deadline for the brekky line-up, so settle for more orthodox Turkish feeds. 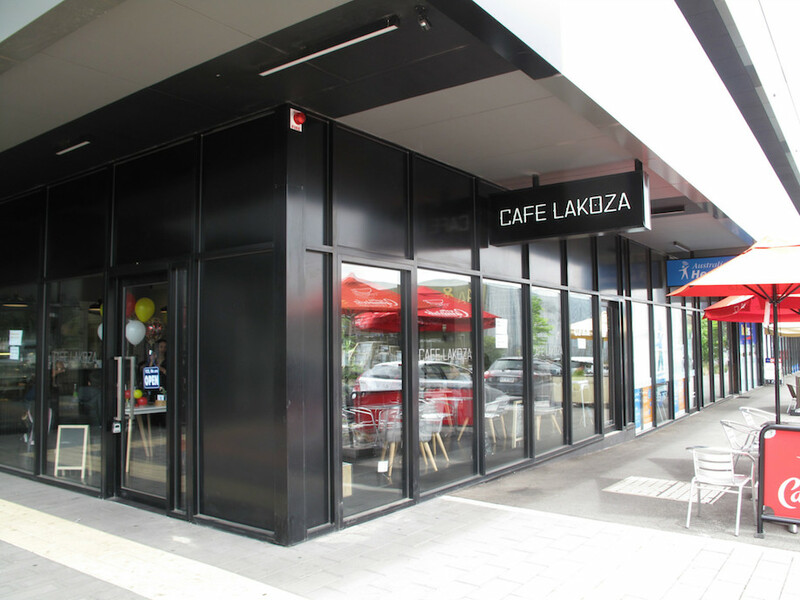 Cafe Lakoza is located right next to Found 401, which has become a well-regarded burger stop, and about a block from a fine yum cha establishment. The place is pretty darn busy for Cup Day; there’s a big family occasion – birthday party? – taking up most of the room. But we are seen to with smiles and in good time, both in having our order taken and in having our food served. … my own choice of lamb alone. Both cost $18 and are wonderful value for money. There’s a lot of food here and neither of us go close to finishing our plates. All is fine and fresh. Good dips and salad and rice. Best of all are the chips – they are excellent. A rarely noted phenomena: Oft times the best chips you’ll find anywhere in Melbourne are those served in joints of the Middle Eastern and/or Mediterranean persuasion. 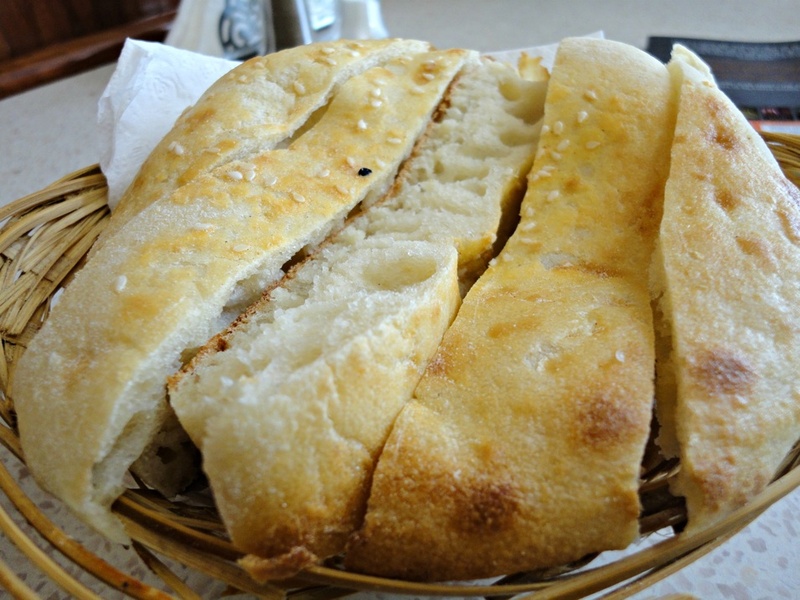 The bread we are served, after a short delay on a busy day, is not the fresh-baked Turkish flatbread we are expecting. It’s more of a bun thing – like a cross between Turkish bread and a regular dinner roll. We finish happy chappies – but not before noting that the halal snack packs being served to another table do look fabulous. 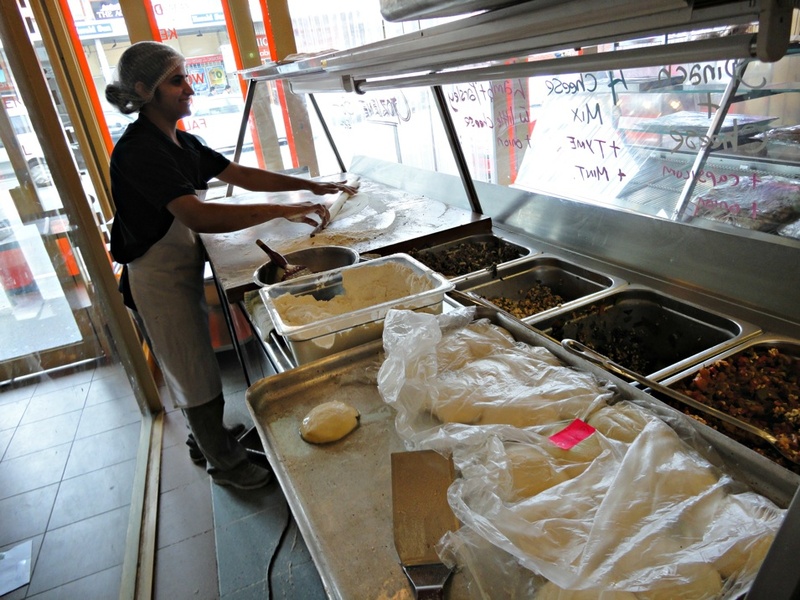 It’s a fine thing to have a good Turkish eatery in Sunshine – and it seems it’s already become a popular fixture. And the location is good, with parking no problem. 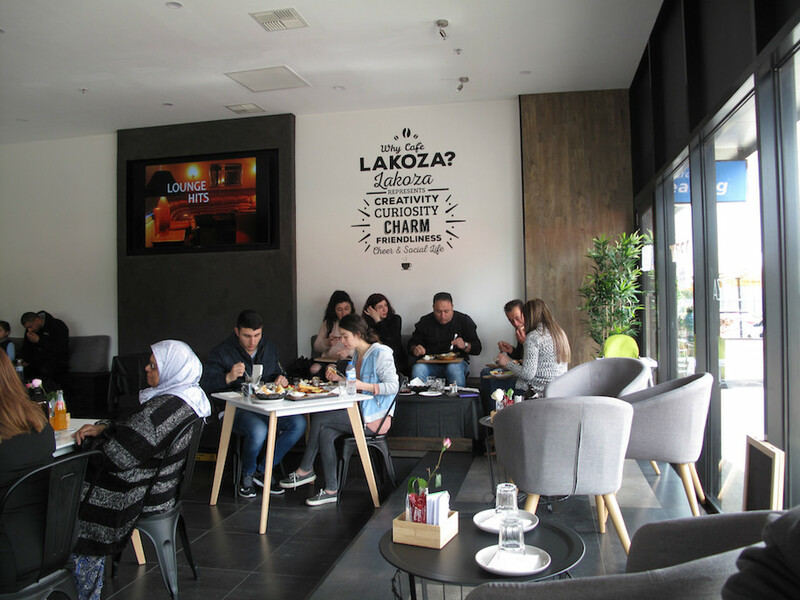 A full menu – and there are some less usual items in there – can be found on the Cafe Lakoza Facebook page. As has been amply illustrated through its six-year history, Consider The Sauce is VERY partial to food with its origins in the Middle East or eastern Mediterranean. That’s something new, for me – I could even correctly be called a Johnny-come-lately. In the course of asking a few people who I figure might know about such things, one name that came up was that of Flemington Kebab House – and I’m only too happy to return to this old favourite to break my HSP duck. I love the idea. Most particularly, I love what a mate refers to as the “positivity” surrounding them and the noble concept of sticking it to Pauline Hanson and her ilk while eating top-notch, multicultural food. But there’s things about HSPs that are definitely turn-offs. So while I know I really should, for the sake of journalism and realism, eat a straight-up, orthodox HSP, I am determined to do some customising. 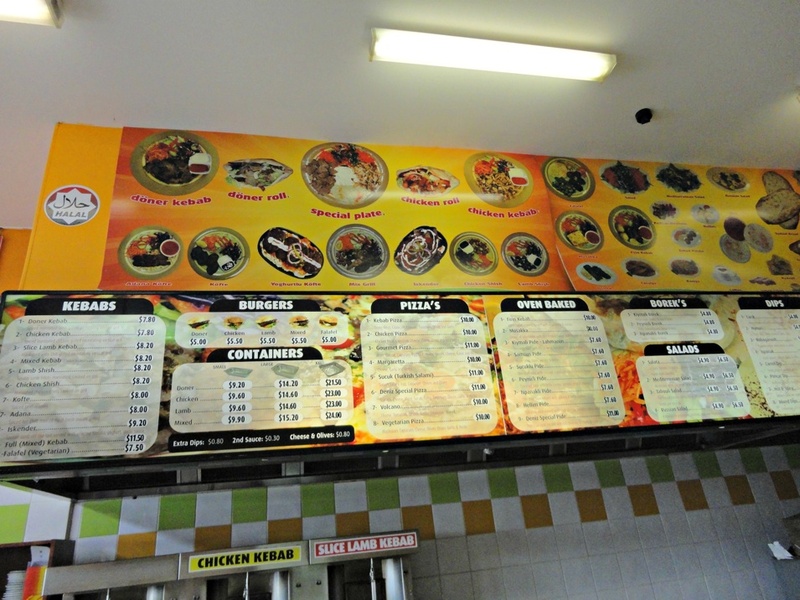 For starters, I recoil with horror when the Flemington Kebab House staff member reaches for the polystyrene and my dinner is subsequently brought to me on one of metal platters on which all their other eat-in meals are served. 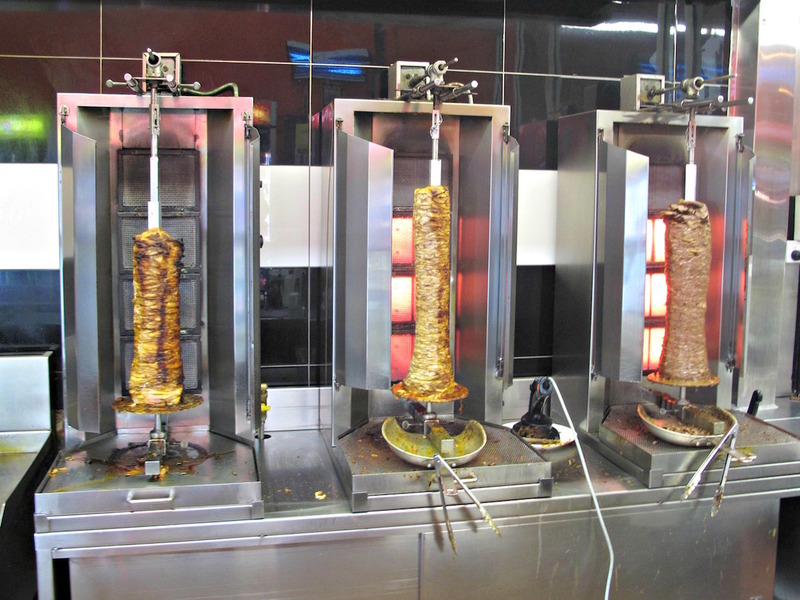 Finally, Flemington Kebab House, being a significant step up from your basic kebab shack, I get to choose from three different kinds of meat – lamb, chicken or the composite/mince brew that is doner kebab. I go for the regular shaved lamb – on chips, of course, and with the regular yogurt and chilli sauces – for $16. And the chips retain at least some of their crispness right down to the very last one. 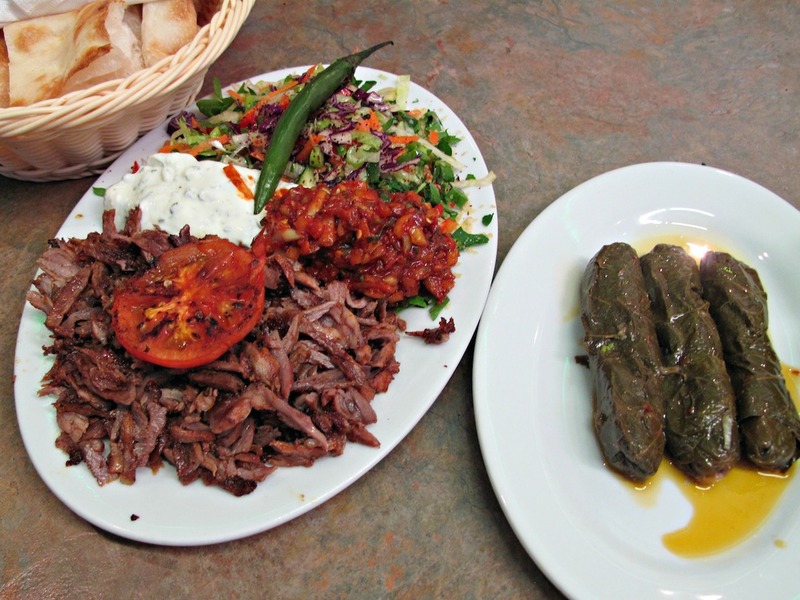 It’s a simple truth that a plate of meat – with dips, salads and maybe rice on the side, and with a stack of fresh, warm Turkish attending – is, to my mind, a much superior meal. Especially at a very fine kebab establishment such as this one. 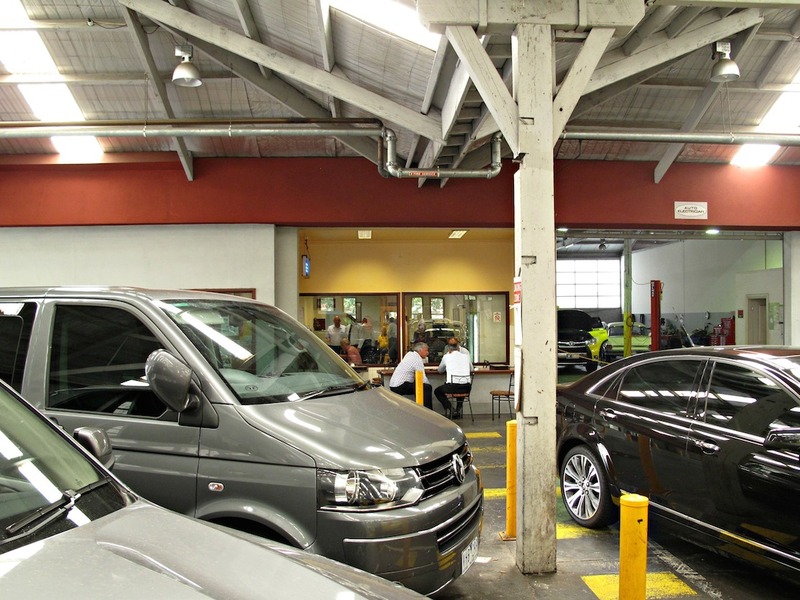 Platinum Taxis has been in residence at Macaulay Road for many years. From No.36 operates a wide range of vehicular services – not just your humble cabbies but also airport and hotel pick-ups, limos and all the resources that drivers need to do their jobs. The current Platinum Cafe set-up, however, has been in-house for just a few months. 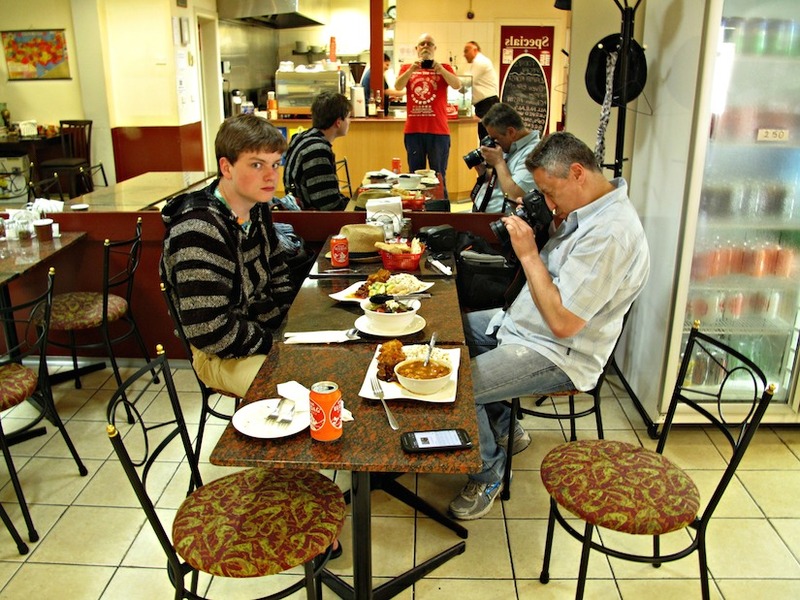 Bennie Weir practises his psycho stare; Nat Stockley photographs food. After our very good pal Nat Stockely realises things have taken a Turkish turn at Platinum, we waste no time in convening a North Melbourne lunch date. Bennie and I are hoping for good, cheap fast-food, perhaps something a little more exotic, perhaps an alternative to the Embassy Taxi Cafe in terms of midnight-hour munchie outings. Sure, the menu (see below) does include burgers, toasties and the like. But wow – we find a whole bunch more than that! The joint is being run by Nadia and her friend Ozen (both pictured at top) and also Lev. 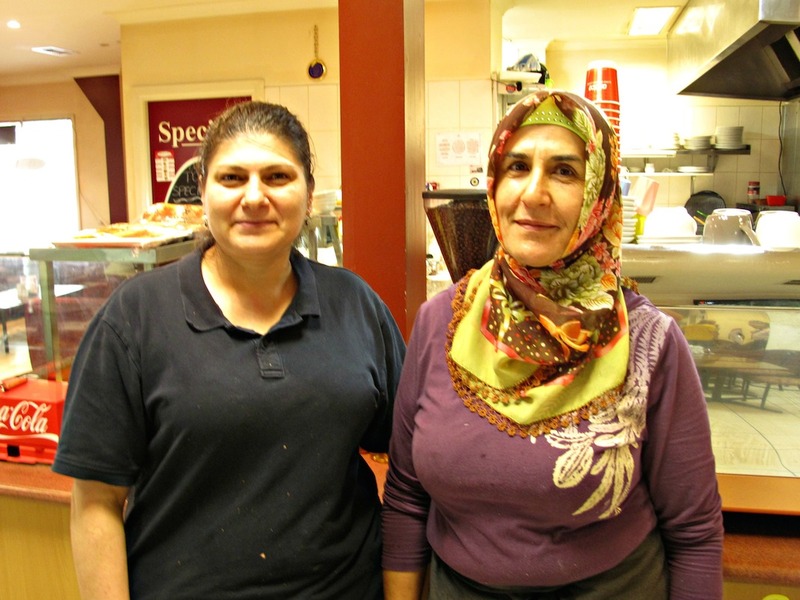 Nadia knows her way around Turkish food, having worked for a Deer park eatery of that genre for more than a decade. But what she and her pals are turning out in North Melbourne is mostly not Turkish restaurant food. 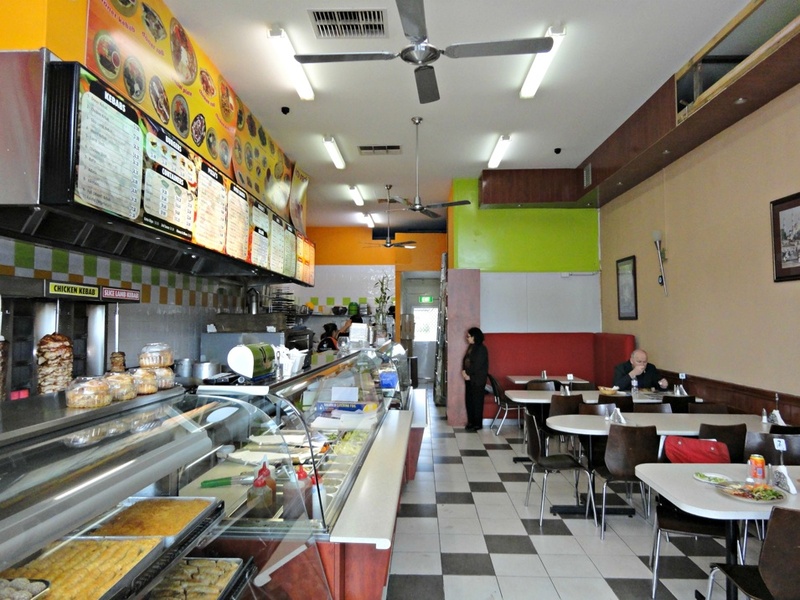 Instead, Platinum Cafe is providing home-style cooking of the kind your favourite Turkish mum prepares. On the day we visit, we’re told to “forget” the specials board (see below) – I would’ve certainly opted for the lamb roast. Instead, we three converge on the bain marie and proceed to enjoy a mighty feast. Very good Turkish rice with orzo. Patlican kebab (eggplant kebab) – one of the best eggplant dishes it’s ever been my pleasure to devour, the slippery, delicious eggplant mixing it with lovely lamb cubes. Mucver – fritters of spud, carrot and egg that are wonderfully chewy. 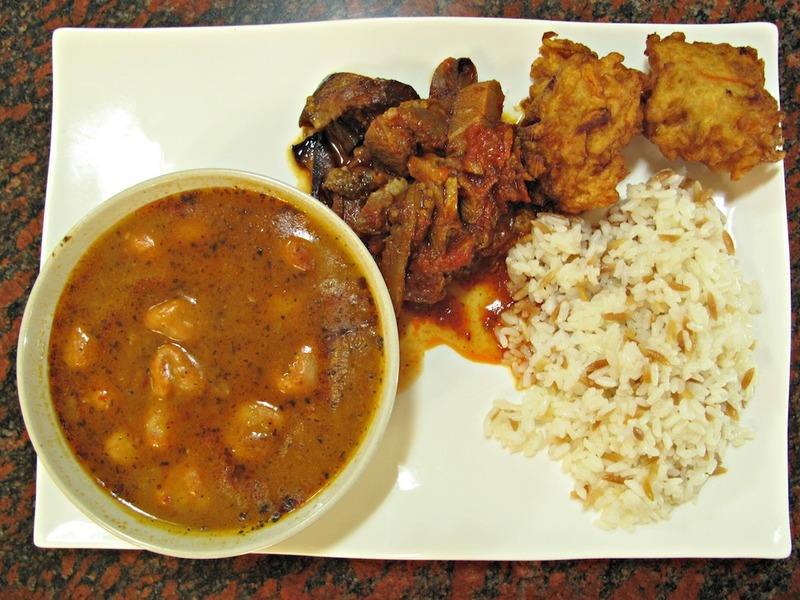 Sulu kofte – Marble-size balls of cracked wheat (quite like gnocchi) and chick peas in a rich soup based on a lamb stock. The cracked wheat balls are more tender than they appear but along with the chick peas constitute a meal in themselves and would probably be better enjoyed as such. The soup, however, is great. 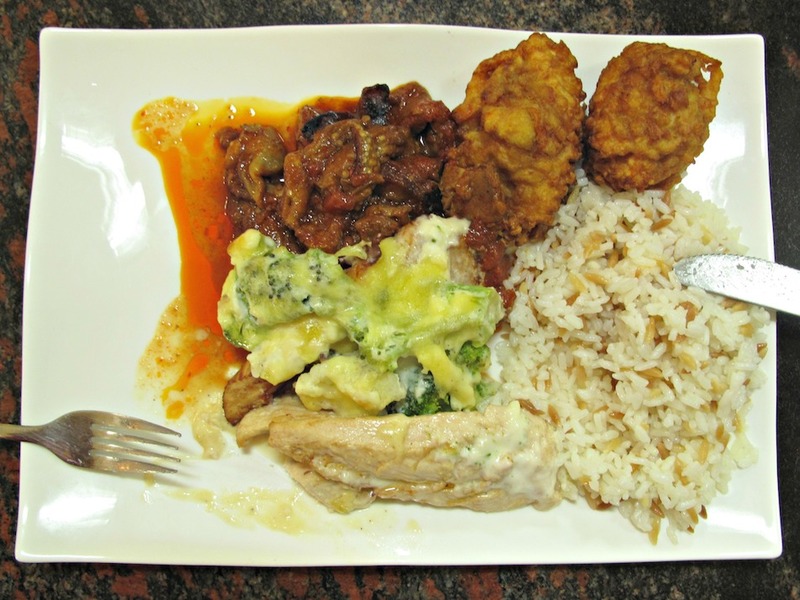 The plates of Nat and Bennie are similar save for the addition of a vege-and-chicken dish with cheese sauce of Nadia’s own devising. 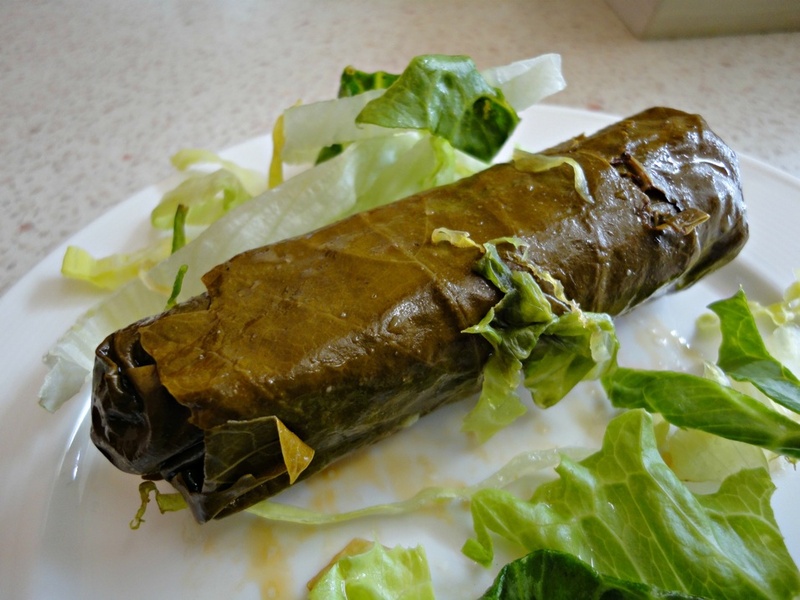 Platinum Cafe also boasts a range of dolmas, including stuffed capsicums, and sarma such as vine leaves. We get a plate of the latter and enjoy them very much. They’re served how we like ’em – cold. They’re quite delicate and have a nice smoky flavour. Nat even reckons there may be meat of some sort involved though Nadia tells me that is not the case. 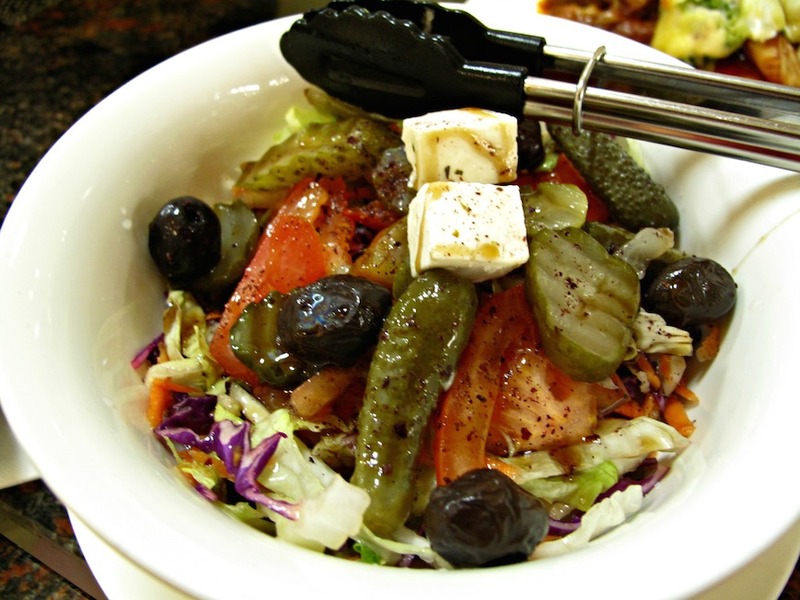 Also provided to our table is a very good salad of finely chopped vegetables, tomato, pickles (both cuke slices and cornichons), olives and fetta – such a shame it barely gets a look in as we explore the rest of our meals. Our meal deals – including our plates, the stuffed vine leaves, the salad and cans of drink – costs us each an awesomely cheap $17. For all of them, I suspect, the Turkish homecooking served at Platinum Cafe is both welcome and somehow familiar, no matter from where they hail. Nadia also warns us that when we return, the line-up of home-style dishes will almost certainly not be the same. Platinum Cafe is open from 6am-8pm on week days and from 8am-5pm on Saturdays. After the excitement of the Dancing Dog building auction, Bennie, Che and I are up for lunch – a late lunch by our standards. 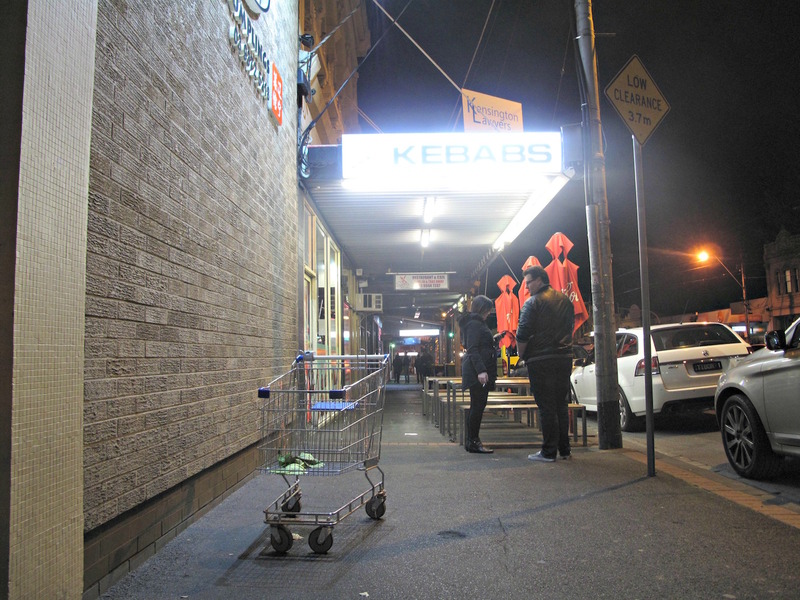 Footscray Best Kebab House is a long-time fave of Consider The Sauce – see older story here. The truth is, though, that my couple of visits in the past year or so have had me wondering if this great place has lost its edge. My solo meals seemed to lack some sparkle and the serves seemed a little on the mean side. But on this visit, we work out a way to make FBKH really sing again. For the three of us we order a large lamb kebab meal ($16) and three stuffed vine leaves ($1.50 each). The stuffed vine leaves are fine but slightly redundant to our purposes. The ordering of a main kebab meal for the three of us turns out to be a masterstroke. The chilli dip is as sensational as ever and the yogurt dip (spinach in this case) is also beaut. The salad is the usual cool and very unique-to-this-place jumble of vegetables. The lamb is sensational, especially mixed with judiciously with both dips. 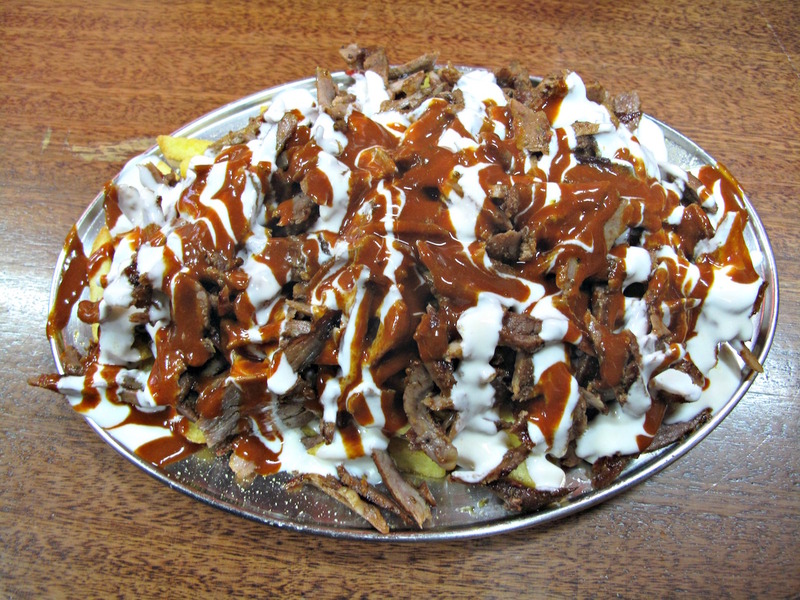 But here’s the thing – this single large kebab plate does all three of us just fine. Much, much more affordable than ordering a small plate apiece at $14 – and it makes much better use of the big serves of the fabulous fresh bread that are routine here. A business meeting of sorts is to take me, for the first as far as I’m aware, to Sunbury. After studying the whereabouts of my destination and the ways of getting there from Yarraville, I resolve to give the ring road and Calder Highway a miss and go for the ease of the $14 toll route instead. It’s then that I recall a tip-off from Juz, No.1 leaver of Consider The Sauce comments, about a kebab joint just off Mickelham Rd on the way to the airport. Now there’s a handy lunch option for my return post-meeting travel! Sadly, the joint is closed – maybe it’s too soon after the Christmas/New Year hullabaloo for a cheap eats establishment to open when situated in an otherwise drab light industrial precinct. So I go tooling off along Mickelham Rd to see what, if anything, this part of the world offers by way of foodiness. It’s within only a block or so that I spot Quick Stop Cafe. The size and style of the signage is so similar to that of the unopened place suggested by Juz that my immediate thought is that the business has simply shifted to a site with more potential drive-by customers. Upon entering, I soon discover that is not the case. Still, I resolve that – come what may – this will be my luncheon venue. Quick Stop does a range of takeaway kebabs, some eat-in plates and even some keen looking Turkish-style breakfasts, such as the Menemen Breakfast of “lightly pan-fried pepper, tomato, cheese with egg” for $8. I order the $12 chicken plate solely on account of the fact I like nicely, deeply tanned look of the chook going around and around behind the counter. As I sit back to await my meal, I look around this small and very basic cafe, which I surmise does a good lunch trade for tradies, drivers and the like, and revelers of various kinds and sobriety later at night – all of which, I subsequently discover, is indeed the case. A handful of the aforementioned tradie types order after me and depart with their takeaway goodies before I lay eyes or teeth on my meal, and I am beginning to feel a little forgotten. It turns out the slight delay has been caused by the house rice being completed. And what rice it is – still slightly al dente, nicely salty and studded with heaps of short bits of vermicelli. It goes real good with the chicken off the spit, which is not as crispy as I have been expecting. It IS delicious, though, and of surprisingly un-oily texture. Both rice and chook, in turn, are super fine with the tangy, fiery chilli dip and the more mundane cucumber and yogurt number. 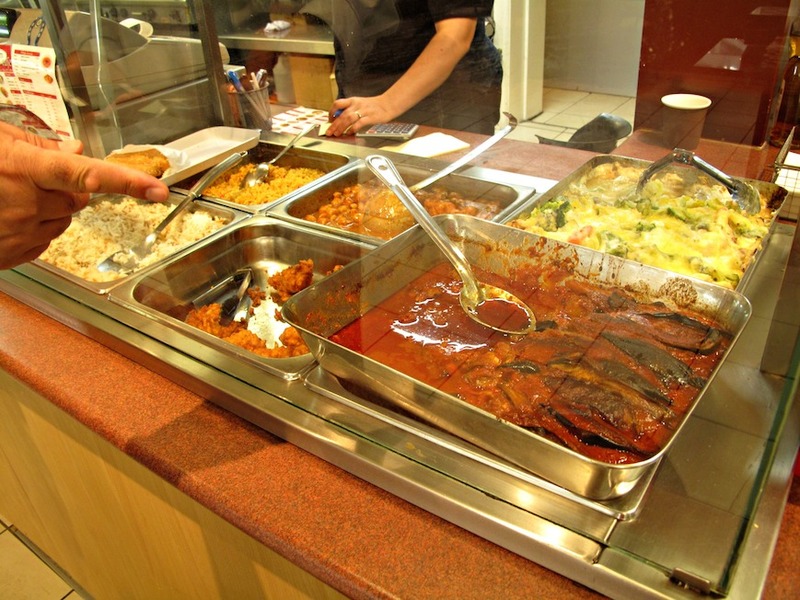 All of which goes to show you can never run out of surprises when it comes to getting a good, affordable feed in Melbourne. I enjoy talking to the staff, including the boss, Amber, before departing in the somewhat sad knowledge that it will surely be a long time before I’m in this neck of the wood again. Here’s a Turkish eats place that sells a lot of the sandwiches otherwise known as kebabs, but which deserves to be considered so much more than a kebab shack. 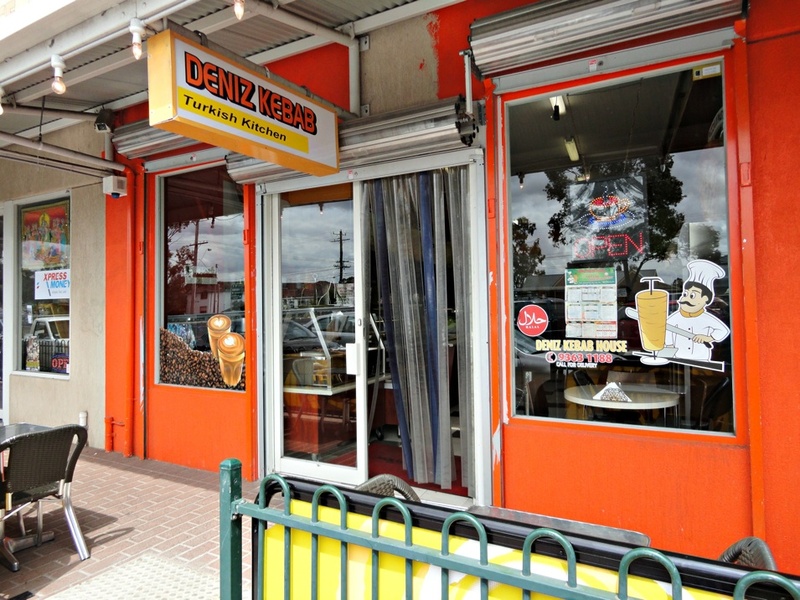 With its homely formica tables, tiled floor, very friendly service and extensive menu, Deniz Kebab House is very much a family-style full-on Turkish restaurant. Talking with owners Tuncel and Inci is very cool, as it always when the people concerned are so full of enthusiasm and passion for what they are doing. Everything is made in-house, they proudly tell me. 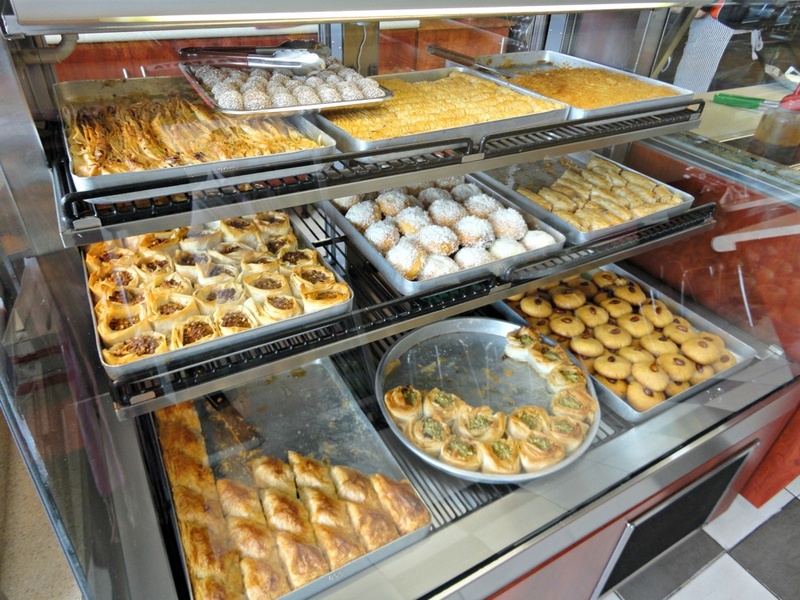 And that “everything” is a lot – not just the various meats, dips and salads but also all the sweets, bread, pides, boreks, pizzas and more. 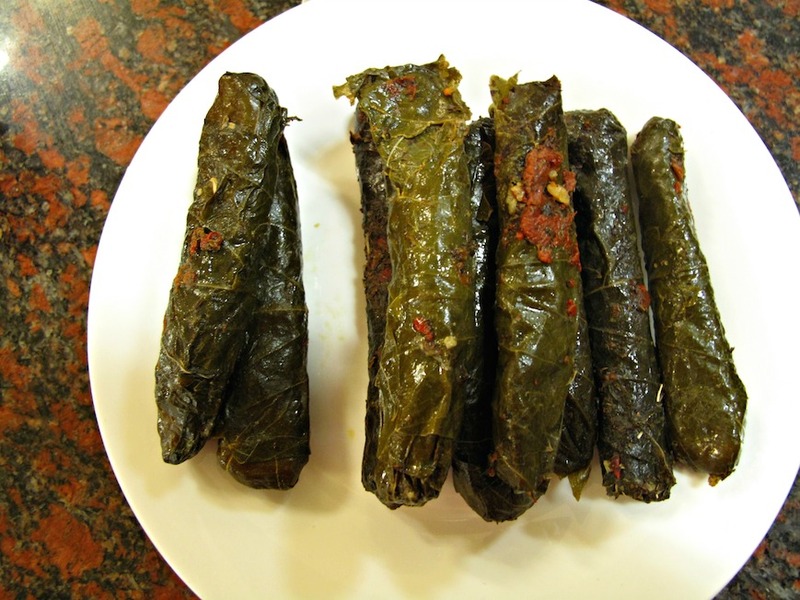 My single dolma is good, with tomatoey rice that is so al dente it’s almost crunchy. I like it that way when it comes my way! 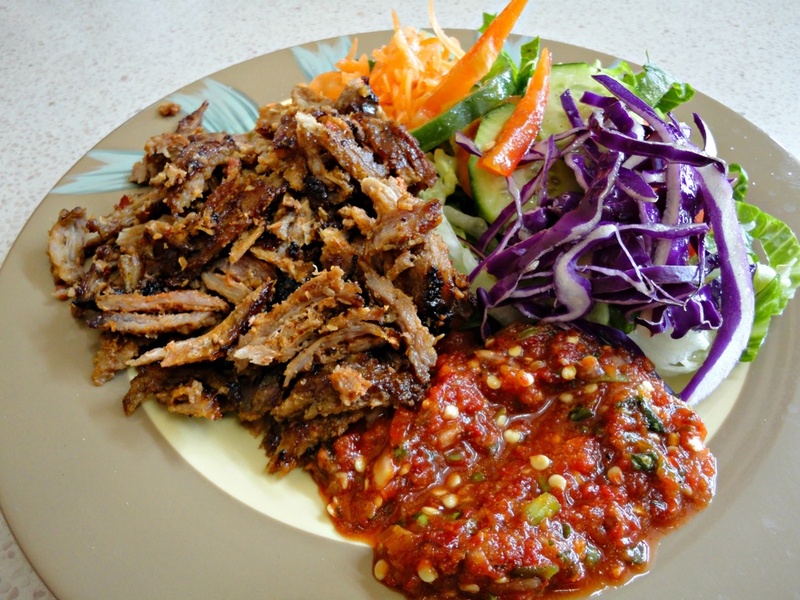 There’s three meat genres going around and around on spits – lamb doner, chicken and one called “slice lamb kebab”. Seizing with glee on a point of difference, I order the latter. It’s unlike any kebab meat dish I’ve ever experienced – nicely, gently chewy with a distinctive flavour that makes me almost think there’s some kind of cheese been used in its preparation. I subsequently discover from Tuncel that the lamb is softened with milk and onion and cooked with salt, pepper, chilli, oregano and paprika. I’ve requested some of the house chilli dip so get that and none at all of the customary yogurt-based accompaniments for such a meal, but I’m cool with that and up for some heat. The chilli dip is fiery hot and piquant, and goes great with not just the meat but also the bread, which arrives at my table so hot and fresh it’s steaming. Dolma, meat plate with dip and salad, can of soft drink and a pide stuffed with lamb and herbs for the next day’s work lunch – and I’ve still got change from $20. Tuncel tells me the opening of Chef Lagenda a few doors up a few months back is good for business in terms of helping the Deer Park strip foster a reputation for foodiness. 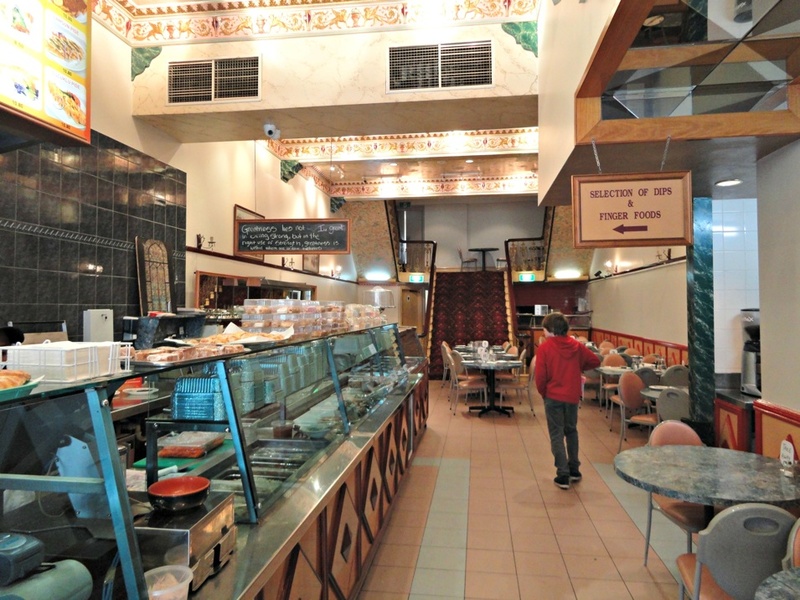 Cafe Global, 373 Sydney Rd, Brunswick. Having satisfied our desire for new, fresh reading material, the Consider The Sauce lads find ourselves kicking around a part of Sydney Rd we didn’t expect to be anywhere near come lunchtime. We’ve tried Mediterranean Wholesalers, open to the idea of cheapo pizza slices and cannoli, but we find all the tables taken. There’s no hurry, I tell Bennie, and this is Melbourne – let’s let the Food Spirits guide us. 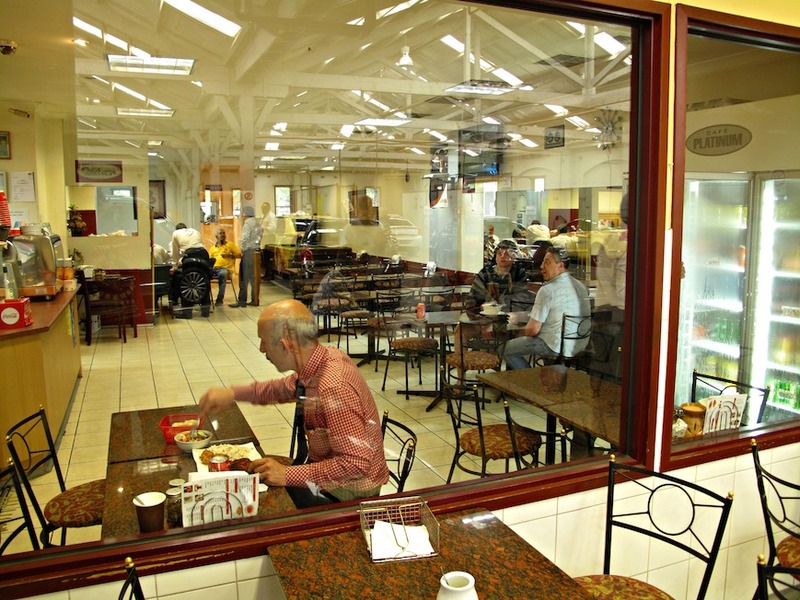 And so it is that we contemplate what looks to be – from the outside – just another drab inner-city bakery. 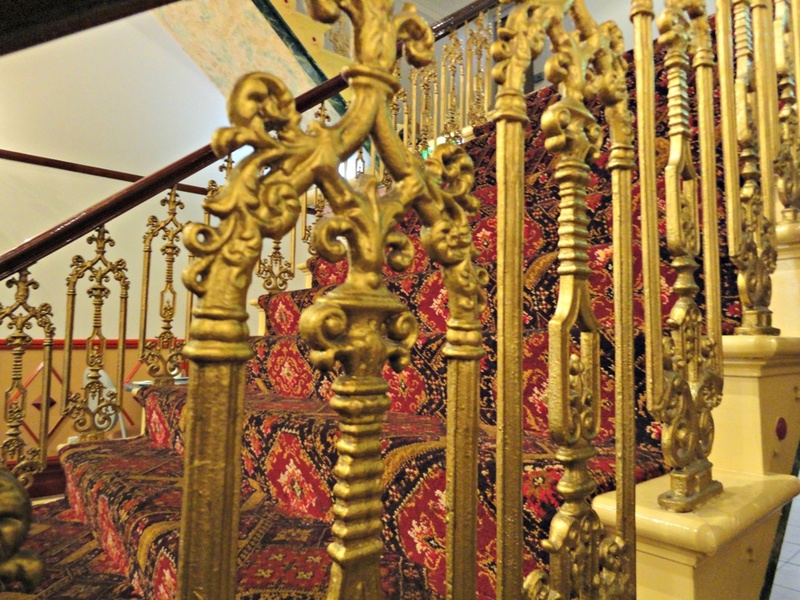 We get a delightful surprise when we step through the door – here’s a grand room done out in rococo style with an emphasis on red and gold, a pizza oven at the far end providing a clue to the premises’ previous incarnation. He looks at me. I grin. We nod to each other – this is it, this is lunch. These days this is Turkish territory. 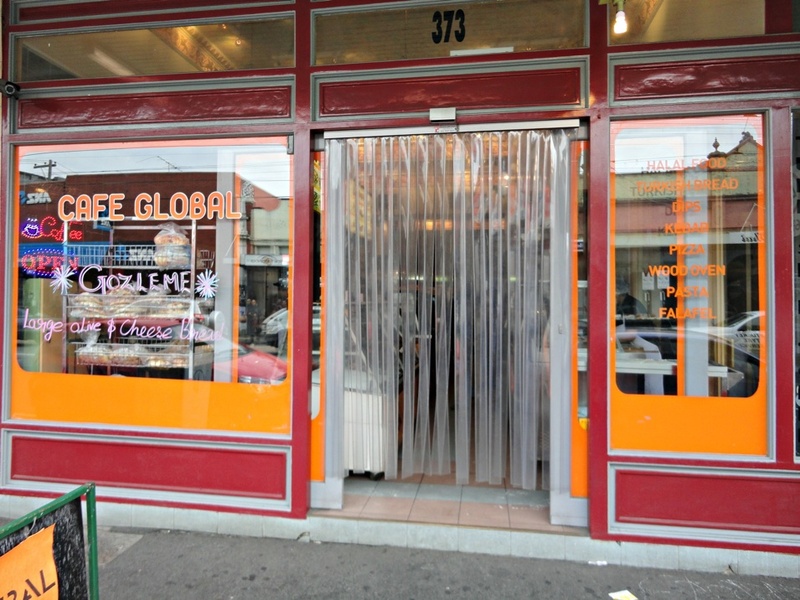 Cafe Global, we are told, has been open about four months and has family connections to another, famous Sydney Rd Turkish establishment. As such, Cafe Global has the dips ‘n’ kebab landscape covered, but we like the look of the place for home-style food potential. 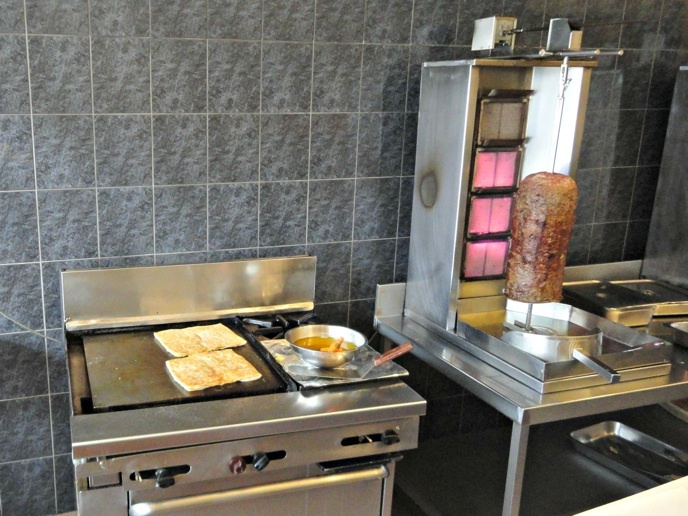 That’s all a moot point for us, as we’re immediately captivated by the gozleme production process being undertaken just inside the front door. The pastry is being rolled out using the traditional wooden pole and stuffed with goodies on the one side, the completed parcels being cooked on the other. 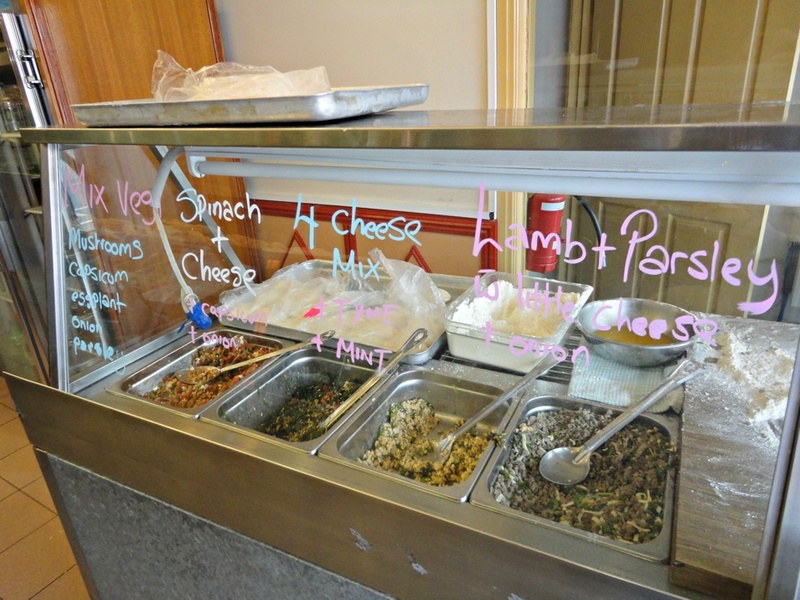 We leave the four-cheese-and-mint and capsicum-eggplant-mushroom-onion-parsley for another day, going with the lamb-parsley and cheese-spinach for $6 a throw. Our lunch is insanely good. The pastry is rich and buttery and light. 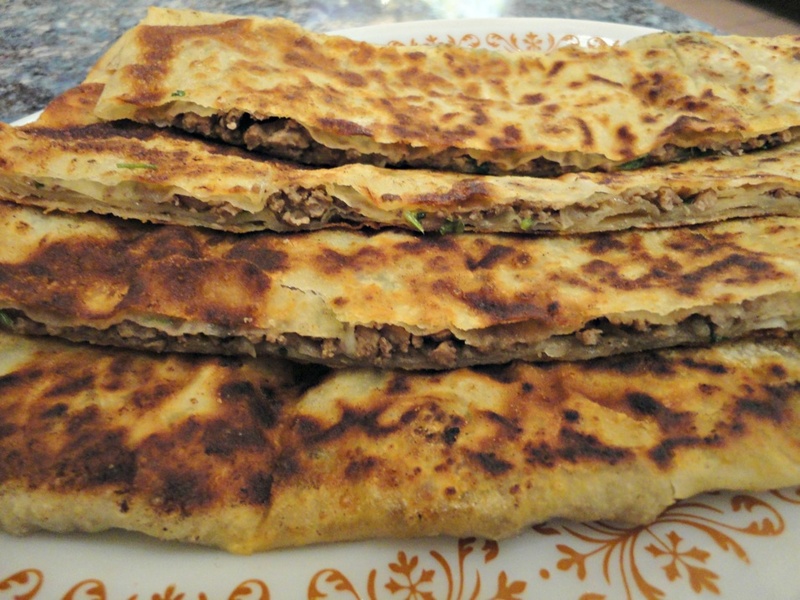 The fillings are flavoursome, their spare lightness and delicacy providing plenty of impact without heaviness. The service is a bit muddled – we get no bread to go with the avocado dip we ordered. But it tastes like a regulation, if very smooth, guacamole anyway. And we don’t receive the two stuffed vine leaves we requested. 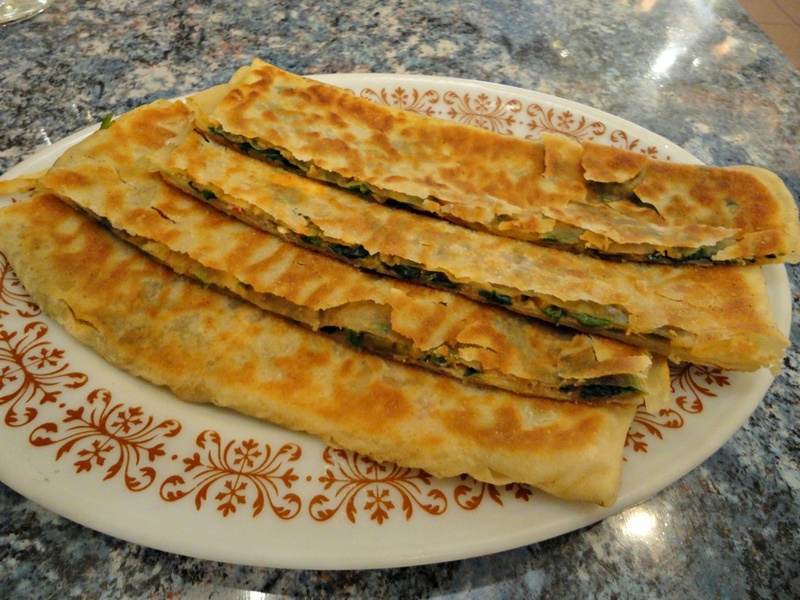 But this is all to the good, so well fed and well pleased are we with our gozleme – so slim, so cheap, so delicious.